Alcester's James Bates battling for the ball. Picture by Paul O'Sullivan. PROMOTION-CHASING Shipston scored 22 unanswered points as they fought back from a half-time deficit to see off a spirited Alcester on Saturday. The Red & Blacks started well and, with their scrum and lineout dominant, they enjoyed plenty of possession in the opening stages. The visitors took the lead after a period of forwards pressure which culminated in prop Matt Ashby crashing over for the first score which Max Biltcliffe converted. The home side got their first points on the board with a penalty, but Alcester still had momentum and they increased their lead when flanker Jamie Clarke ran an excellent line before popping up after the tackle to Ashby who dived over for his second try which Biltcliffe again converted. Both sides suffered blows in the latter stages of the first half as Shipston lost a man to the sin-bin after an infringement around the time the visitors lost skipper Phil Birks to a blood injury. In the closing stages of the half Shipston began to get more into the game, helped by a string of penalties against Alcester, who eventually lost wing Ross Garde to the sin-bin as the referee yellow-carded him for being offside. Shipston added a further penalty before the break to trail 14-6 at half-time and, with the slope at their back in the second half, the hosts were a different proposition and Alcester found it hard to get out of their own territory. After Shipston had crossed for their first try, from then on in the writing was on the wall for Alcester as the hosts crossed for two more tries which were converted. Ninth-placed Alcester have an important period of fixtures over the next three weekends when they play the teams immediately above and below them, starting with Saturday’s (2.15pm) visit of Coventry side Stoke Old Boys to Kings Coughton. SHIPSTON 2nds ensured their club competed the double over Alcester with a convincing victory. 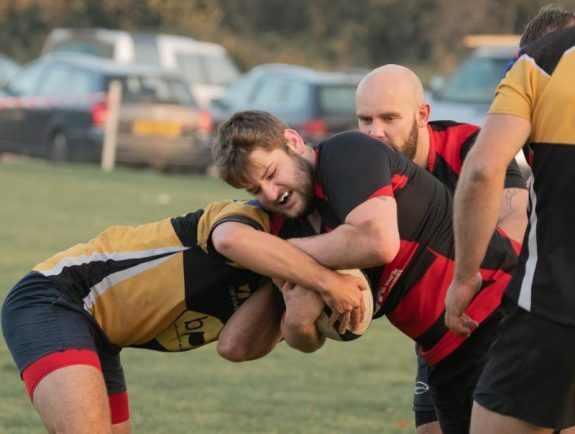 For the first time in a few weeks, Alcester were able to field a full squad including substitutes, but they met a well-organised Shipston side who scored a try after three minutes and never looked back. Alcester’s only points came from the boot of Luke Spencer to bring the score back to 5-3 as, despite them crossing the line no fewer than three times during the game, they were held up on each occasion. The visitors lost second team top try-scorer Scott Carmichael to a nasty cut on his head and he was unable to return in the game and, whilst they were bolstered by the Johnson brothers Ed and Matt as half-time substitutes, they could not prompt better fortunes for their side as Shipston scored four tries in victory.